1 of 7 Heat oven to 425 degrees F. Coat a rack with nonstick cooking spray, place in a roasting pan and set aside. Combine juice, soy sauce, garlic, seasoning and oil. 2 of 7 Place chicken quarters and 1/4 cup of the orange juice mixture in a bowl; toss to coat. Remove leg pieces; place on rack in the roasting pan, leaving the breasts in the marinade. Roast in oven 10 minutes. 3 of 7 Meanwhile, add potatoes to a second roasting pan. Drizzle with olive oil and 2 tablespoons of the orange juice mixture; stir to coat. 4 of 7 After legs have roasted for 10 minutes, add breast pieces to rack with legs, discarding marinade. Place potatoes in oven on lower rack. Roast 30 minutes. 5 of 7 Meanwhile, whisk cornstarch into remaining orange juice mixture; place in a saucepan. Bring to a boil and cook for 3 minutes or until thickened. Set aside. 6 of 7 Add scallions to potatoes when there are 5 minutes of cooking time left. 7 of 7 When chicken is done (instant-read thermometer inserted in the thigh without touching bone registers 160 degrees F) and potatoes are tender, remove from oven and turn on broiler. Brush chicken, potatoes and scallions generously with thickened sauce. Broil chicken for 3 minutes and potatoes for 2 minutes to crisp. 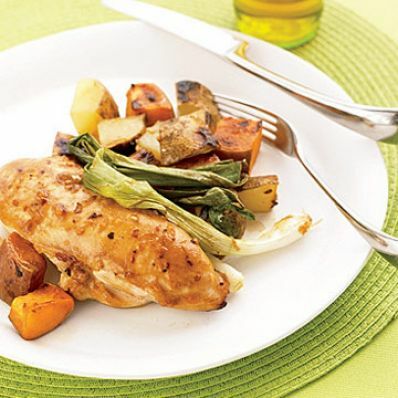 Serve chicken and potatoes warm, topped with scallions. Per Serving: 59 g carb., 10 g Fat, total, 490 kcal cal., 44 g pro., 567 mg sodium, 6 g fiber, 122 mg chol.